2008 (Limited edition 2xCDR set). This release is a departure for the Hypnos Secret Sounds imprint in that it will be a two disc set. 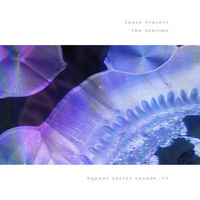 Sense Project is an alter-ego of Robert Logan, who releases experimental electronic music under his true name, including the truly amazing debut CD Cognessence. Robert also composed the music for Alex Gibney's Oscar-winning documentary feature 'Taxi to the Darkside' along with Ivor Guest and Philip Sheppard. emerging artist but this one justifies its duration without question. "Naming one's release The Sublime reeks of pretension but that may be the only misstep Robert Logan's (aka Sense Project) guilty of on this ambitious double-disc set. It's the most sonically and stylistically wide-ranging of the releases reviewed here, and boasts some truly fine moments. Each piece pursues a different direction, and thus every one brings with it surprise. It's also a less hermetic recording than the others, as Logan opens the studio doors to let vocalist Andrea Black and string players Sarah Sarhandi and Francis Logan contribute; he also broadens out the music's electronic core by integrating bits of field recordings here and there (e.g., “A Moment,” “Éjjel”) which lend the material a more naturalistic character.... Though long at two hours, there's much to admire about Logan's accomplished collection.